For many years I have watched as my country, the United States of America, went down the path of becoming a criminal state, and I did nothing. I was afraid that if I spoke up, if I protested, that "they" would come after me! Today I watched a movie. "Citizenfour". The story of Edward Snowden. A man who is NOT afraid. A man who spoke up when he encountered our country doing criminal acts. Snowden saw our country violating our Constitution and he went public. Snowden put his own freedom into jeopardy in order to tell us about what was gong on. How the government was snooping without getting a warrant. Violating our Constitution. In fact, the government has crushed our Constitution into nothingness. We no longer even have a Constitution that is working anymore! Everybody breaks the law now. Our President breaks the law. Our Supreme court uses its judicial power to judge unconstitutional laws, constitutional. Much of our police steal things from our citizens in the name of asset forfeiture. Our military terrorizes the world and kills persons with drones. The military tortures prisoners. Our Treasury Department demands reporting that causes foreign banks to refuse American customers with the goal of stripping away our freedom to do with our money what we want. In the name of fighting terror, we have lost all of our Constitutional protection! We no longer are the Republic that we once were. We are some kind of a corrupted dictatorship. I will likely lose a lot of readers with this blog post. But I cannot be a chicken anymore. Not with Edward Snowden being so damned brave. I just could not be a chicken even one more second!! When I moved into my apartment in April, 2014, I was informed by the apartment manager that only Cox serviced this area for internet and TV. After awhile, I found out that AT&T also served the apartment. However, I never checked the prices of AT&T to compare to the Cox prices. A couple of days ago I received an email from Cox advising that their price for TV and internet was going up from $115 to $150 a month. Wow, I thought! That sure is a gigantic increase! When I phoned Cox and tried to bargain, Cox was not interested in bargaining with me. There is an AT&T store not too far away. So, I biked over there to pay them a visit. It turns out that AT&T does service my address. And the price for internet and TV is only $92. That is less than my old Cox monthly price. This morning the AT&T installer came to set up my new internet and TV service. It works really good. And the channel guide is much superior to Cox. When I phoned Cox to cancel my services, they wanted to know why? I replied, "Because you raised my price from $115 to $150." The lady on the phone from Cox asked me to wait a moment while she checked the prices. When she returned, she told me that I could get my TV and internet service for the old price of $115. "Sorry! ", I told her. "Too little and too late." What nerve they have!! I am supposing that you may be concerned with what is going to happen to your financial future. So am I concerned about mine! 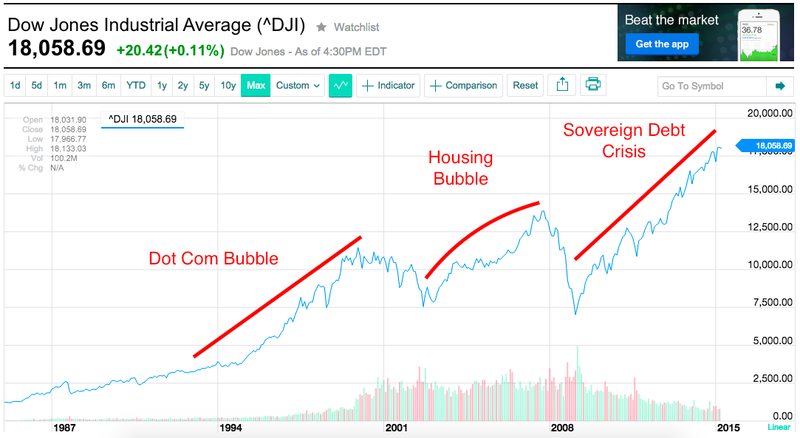 Below is a graph of the Dow Jones Industrial Average highlighting the Dot Com Bubble, Housing Bubble and now the Sovereign Debt Crisis [SDC]. The SDC was born when our government using the power of the Federal Reserve saved the big banks by loaning them huge amounts of dollars. But the Federal Reserve did not have money to loan. So it just created the money to loan the banks out of thin air, as it had been doing for a long time. When the Federal Reserve did that, a lot of sources for our country's borrowing just dried up. Those sources did not want to throw good money after bad. So the Federal Reserve began buying United States Government debt itself. Stuff like US Government Bonds the Fed just bought up. And the Federal Reserve again paid for that debt with money it created out of thin air. Now here is the thing. When the Sovereign Debt Crisis got going around 2008, the Public Debt was about $10 trillion dollars. Right now the Public Debt is more than $18 trillion dollars. The Fed has been holding the interest rate that it pays on that Public Debt at just about zero percent, because interest paid on $18 trillion dollars is a LOT of money! You know something? If I told you that you did not have to pay your credit card debt anymore, would you believe me? All you need to do is get a brand new credit card and transfer the balance from your old card to your new one. And just keep doing that forever. This is pretty close to what the Fed has been doing. Works for them! By the way. The little graph at the bottom of the Dow Jones chart is the volume of the Dow Jones Industrial Average. Do you see how that volume begins to radically decline after 2008? Looks like a lot of investors are leaving the market. I wonder why? 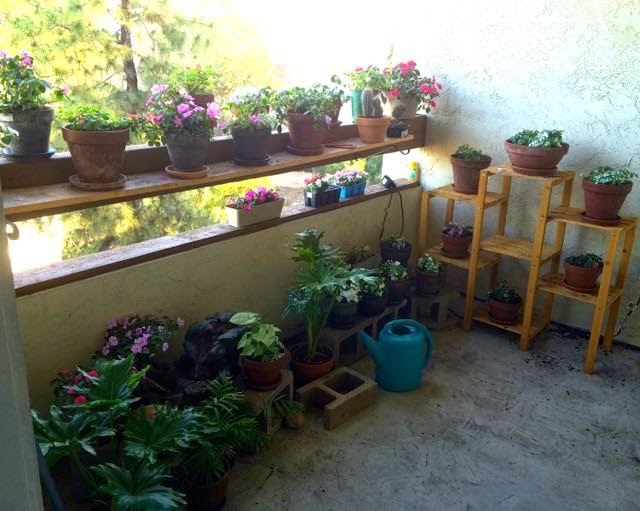 Ever since I moved into my Guava Gardens apartment in April 2014, I've been messing with the balcony. I wanted plants, but did know which ones would do well on my north facing balcony. A pond was something that I thought would be neat too. The pond turned out to be not good for this balcony. Not enough light. Also, the water in the pond got algae. When Yolanda, the lady who cleans my apartment, saw that the tub for the pond was not being used, she asked if she could have the tub. I was so happy she asked for it! After a bit of time, it was clear that impatien flowers really love the environment of my balcony. On buying a bunch more of 6-pack and 4" impatiens, the garden began to bloom. There is a brickyard not too far away from Guava Gardens, and I began to buy various size concrete bricks. My plan was to have a mound of bricks that the flowers could be placed on at different heights. Below is a video of what resulted. I have been accumulating a pile of paper documents and do not know what to do with them. There is a nice hanging file drawer next to my desk. But this pile of paper documents won't fit there. So, I decided to go paperless. Using my iPhone and a software program named "Doc Scan", I have learned how to digitize a paper document. Then, I found a software program called "EverNote", which is supposed to allow a user to store digitized documents in a flexible way. Search for documents, etc. Now, here's the thing. It usually takes me a lot of time to get over the learning curve to be able to use a new piece of software. The amount of time required to get software under my belt is the reason that I am blogging to you today. Is time more valuable as I get older? I've been trying to figure out this "paperless project" for a couple of days. It has been my experience that it has always taken me a considerable amount of hours to learn new computer stuff. That's just the way it is. No getting around it. But I am now in my 78th year of life. And I do not think so lightly about time anymore as I used to do when I was younger. It has occurred to me that I should simply just keep on throwing paper documents on the pile, let them accumulate, and just forget about this paperless project. A garden has bloomed abundantly on the balcony of my apartment. 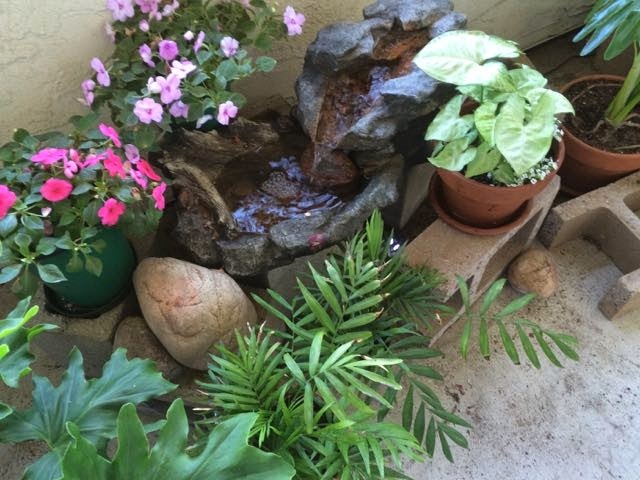 Even a tiny waterfall is there! About 1/2 mile away from my apartment home is an RV lot. If you want to rent an RV, they will rent one to you there. When I go on my bike rides, very often I ride my bike on that lot looking at the selection of RVs. And I wonder about perhaps renting an RV and taking a trip. Maybe this summer? Today is Easter Sunday. I was invited over to John & Mimi's home for supper. John and I really like sitting in the shade of his backyard enjoying all the bird life. John loves throwing shelled peanuts out in the yard for the blue jays to swoop down and wisk away. "I've been thinking about renting an RV from that RV lot near my apartment", I told him. "But after a couple of months of consideration, I've decided that I really do not want to go RVing again." "Why is that? ", he asked. "I'm so comfortable in my apartment. Just hanging around there doing the stuff I do is really neat. Going out on an RV trip doesn't have the pull on my heart-strings anymore as it did when I was full-timing over those ten years on-the-road." "Yeah", John said. "I understand how you feel." You might remember that I wrote to you about me using a YouTube video which had the sound of falling rain to help with falling asleep. I recently changed that sleep-aid to a virtual aquarium which has the sound of air bubbles flowing up thru water. First click the Arrow to start the video. Then click the little box at the bottom-right of the video to fill your screen.